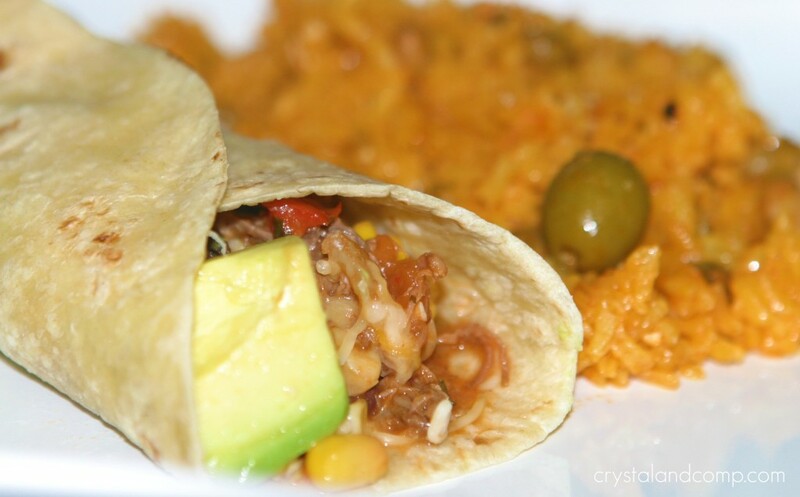 These Tex-Mex wraps were delicious and they were a hit at my house. My husband will eat anything, but when he likes something, he goes on and on about them. He loved these. And my kids love anything served in or with a tortilla. What I like about this recipe is that it’s simple, perfect for a crowd, and really it is two recipes in one. You can stretch this to feed an army, which is perfect when you have holiday guests to feed. 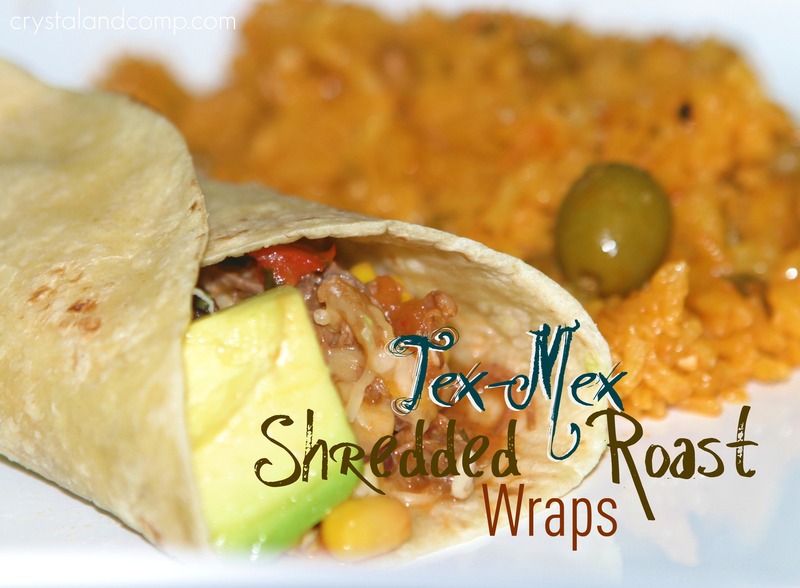 This is my adapted version of two Texas Beef Council recipes: a Simple Roast shredded into Tex-Mex Wraps. 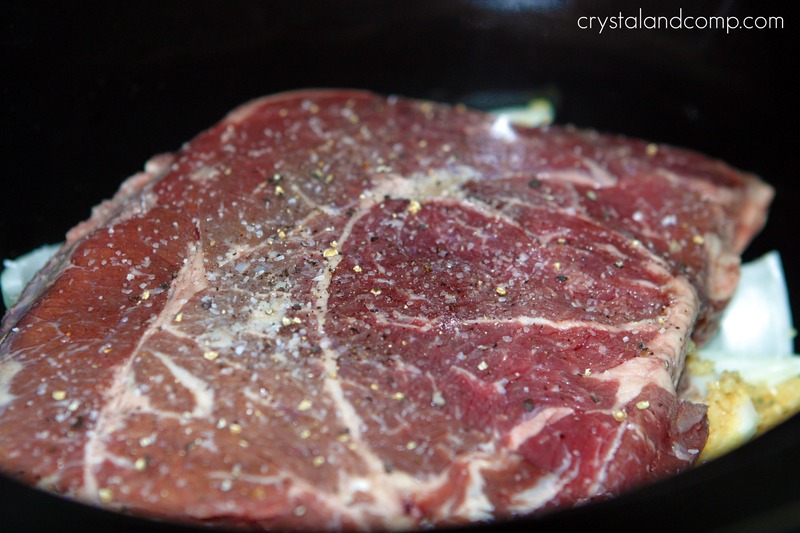 Start by making a basic crockpot roast. (You are going to love how easy this is!) You can stop there and serve you roast with your favorite sides, but I shredded the roast and converted it into wraps. Another option would be to have roast the first night and these wraps using leftover roast another night. You decide. 1/2 c cooking liquid reserved. toppings like: shredded cheese, lettuce, sour cream, tomatoes, etc. 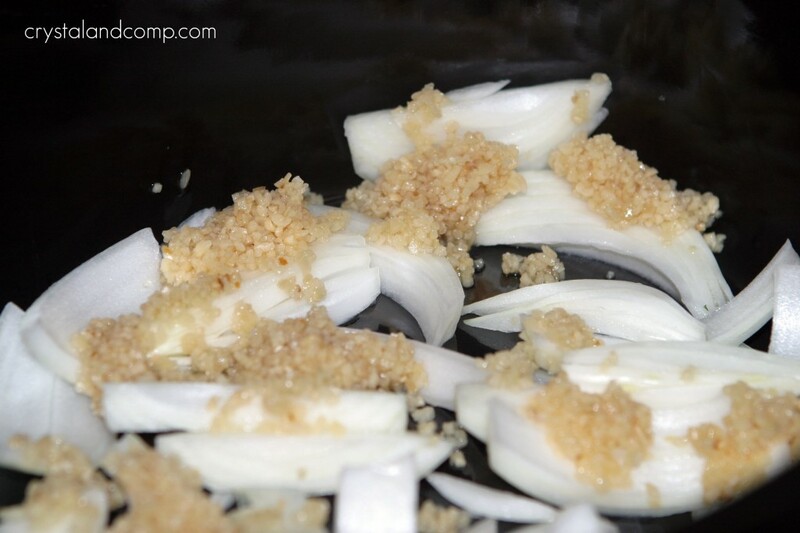 Place your roast in the crockpot over the onions and garlic. Pour in the water. I did not pour it over the roast, just poured it around the side of the roast. Set it on low for 8-10 hours. The key is slow and low here. My crockpot has a timer, so I did the 8 hour low option and then it moved to warm automatically. When the roast is done, it will look like this. Serve your roast with your favorite sides and then make the wraps with the leftovers. OR, or make the wraps now. Like I did. 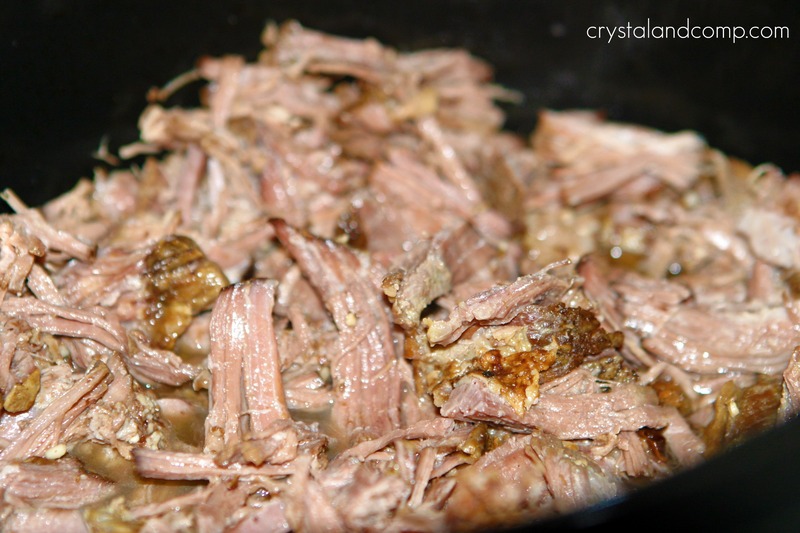 Remove the roast from the crockpot and shred it with two forks. Reserve 1/2 c of the cooking liquid. You can re-purpose the onions, garlic and remaining liquid if you like. Add the shredded beef and 1/2 c liquid back to the crockpot. Add the jar of salsa and frozen corn. Pop the lid back on the crock and cook on high until the corn is done- about 1 hour. The last 5 minutes or so, heat your tortillas in the microwave or oven. Scoop the salsa-meat mixture into the tortillas. 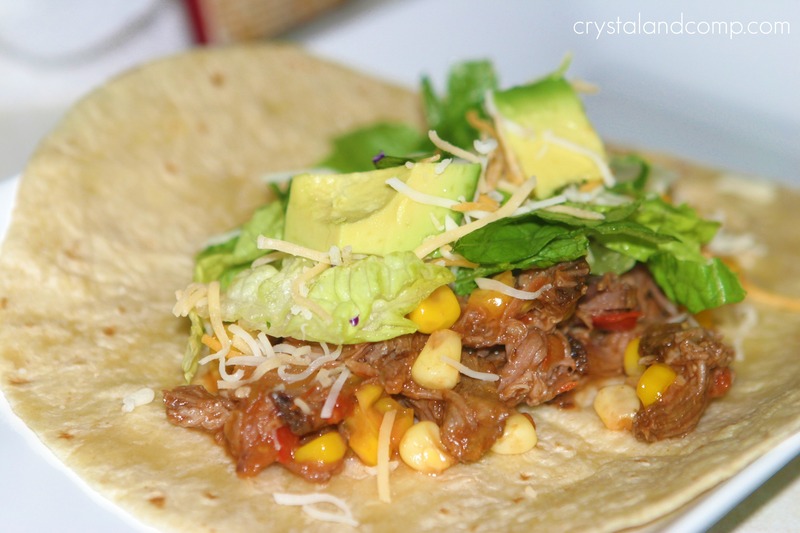 Top with your favorite toppings and roll the tortilla like a wrap or serve like a taco. We served ours with Puerto Rican rice. Don’t forget to check out all of my easy recipes to make meal time less stressful. ½ c cooking liquid reserved. Set it on low for 8-10 hours. The key is slow and low here. 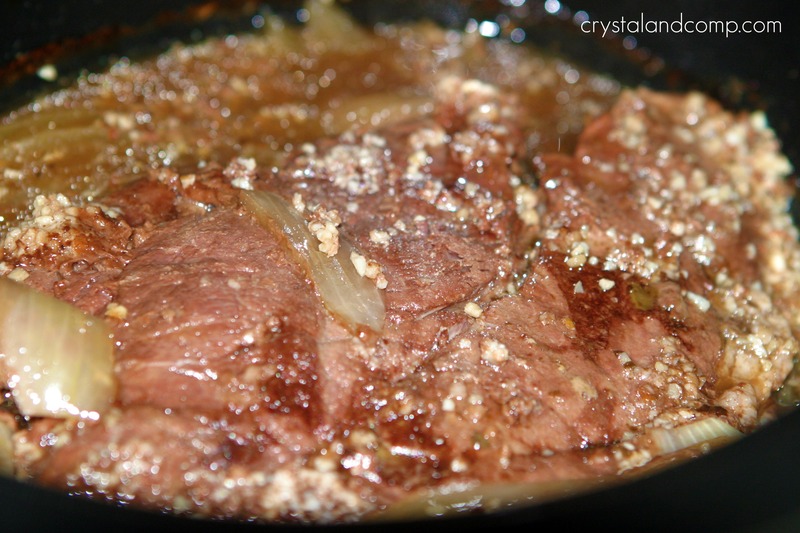 When the roast is done serve it with your favorite sides and them make the wraps with the leftovers OR opt to make the wraps using all of the beef. 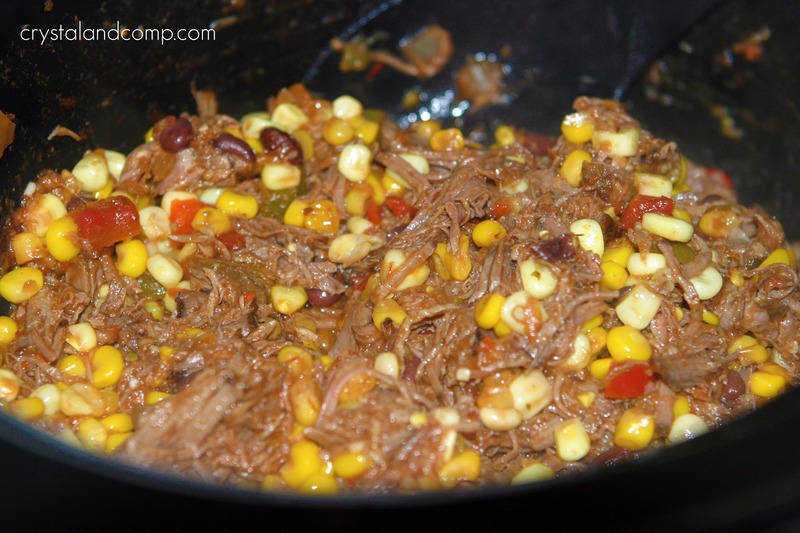 Add the shredded beef and ½ c liquid back to the crockpot. We served ours with Puerto Rican rice. Yum and easy! Oh Crystal – this looks wonderful! I have a similar recipe using green chiles, I would love to switch it up and try this. Amber, they were really good and so easy. The roast just fell apart. Let me know if you make it. I hope your family enjoys it. Oh my goodness, it is lunch time and I would just love to have one of these great wraps for lunch. This is an awesome recipe, I can’t wait to try it. Thank you so much for sharing with Full Plate Thursday. Wishing you and your family a very Happy New Year and Abundant Blessings in 2012! You sure know how to use a slow cooker! Love this recipe!